BISMARCK – The Valley City Municipal Auditorium, more commonly known as the City Auditorium, has been listed in the National Register of Historic Places. The National Register of Historic Places is the federal government’s list of properties it considers worthy of preservation and recognition. The City Auditorium is a large, multi-purpose Art Deco building built in 1936. It is primarily significant for its role in the history of Valley City; the events that have taken place in the building are the history and fabric of the community. The architecture and quality of construction, representing both the simple, bold Art Deco styling of the 1930s as well as the workmanship of local contractors, contribute to the significant history of this building as a major project under the auspices of the Works Progress Administration. 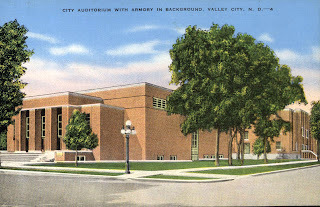 The Auditorium’s relationship to the next door armory, to the campus of Valley City State University, and proximity to downtown Valley City were major deciding factors in having Valley City designated as the home of the North Dakota Winter Show, which it has hosted since 1938. During World War II, the City Auditorium was the community hub of home front activity when it came to bond rallies and United Service Organizations (USO) fund raising events. Its space was used to register all Barnes County citizens for the food rationing programs and was indispensable to the World War II home front activities of Barnes County in general, hosting many community meetings, information sessions, dances, and public gatherings. Peggy Lee performed on the Auditorium stage March 6-9, 1950, three shows each day with the Dave Barbour Orchestra. Other vaudeville and big name entertainers also took the stage. 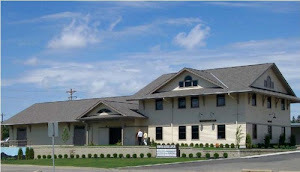 The Auditorium has been used for community theater and civic concerts, graduations, political and agricultural conventions, public meetings, sports events, and any large meeting that no other facility was able to accommodate with expected attendance. The City Auditorium has a long history as the heart of civic events in Valley City. Beginning with the community investment made in the midst of the Great Depression, the citizens of Valley City have used and maintained the City Auditorium as an invaluable public resource through the present day. The Bridges Arts Council is currently looking at possible repurposing of some of the spaces as a community arts center, continuing the building’s long history of serving the community’s needs.